If ever there has been a “bah humbug” kind of guy at Christmas time, it has been this writer. I have been sickened by the excessive commercialism, the crazed rush to the stores and the social pressure to exchange gifts during social get-togethers. I am not a Christian. I cannot accept the Bible story about a super human, burn of a virgin, who walks on water, raises the dead, feeds a crowd from a basket containing a couple of fish and some bread, then turns himself into a blood sacrifice for the sins of mankind. I question that a special star hung over Bethlehem on the night Jesus was born, that the star brought wise men to the scene from miles away bearing gifts, and that angels were in any way involved. 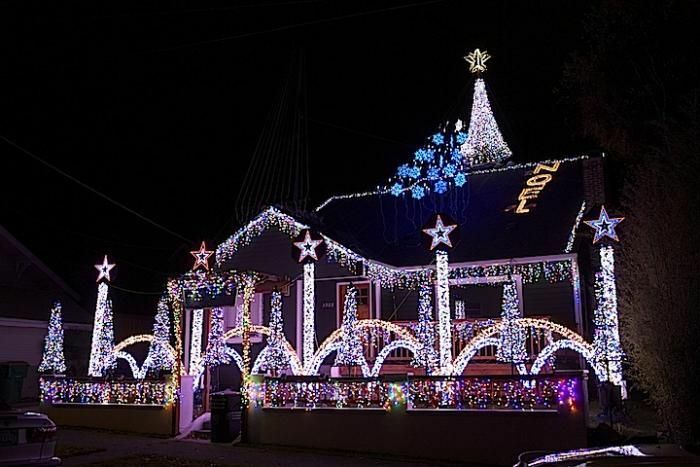 I used to dislike the excessive “waste” of electric power used by people in the neighborhoods who compete for the best Christmas electric displays but lately I have had a change of heart about that. Maybe my heart has been softened by the fact that my late wife Doris enjoyed displaying a little imitation Christmas tree with lights every year. She would put her tree in a front window of our home as a way of wishing good will to everyone who looked upon our house. She died unexpectedly in June, 2013 and isn’t in our home any longer to put up her little tree. My daughter discovered the tree in a closet and put it on display this year in Doris’ memory. I was glad to see it shining again. I confess it brought a tear to my eye. The last time I saw my late father and late brother was on Christmas, 1998, when Steve and I drove Dad around Albuquerque, New Mexico to enjoy the light displays. I drove off the next morning and they both died before I saw them again. So yes, I get sentimental now when I see the Christmas lights. They bring back good memories. But there is something more. Christmas and most of the traditions that go with it stem from a pagan celebration of the winter solstice, or the shortest day of the year which falls on December 21. It is the day when the Earth tilts so that the Northern Hemisphere is turned as far away from the Sun as it ever gets. The nights are long, cold and dark. It is a time when people suffer depression and sadness. Lighting up the neighborhood, gathering together for feasts and cheerful holiday events, and celebrating things like Halloween, Christmas, and New Years are good for everybody involved. The holidays help make the cold dark days pass more quickly, and add a bit of happiness and cheer. While I still refuse to celebrate the birth of a super baby in a barn over 2000 years ago, who became the foundation for a religion that has brought too much misery to an already troubled world, I admit that the invention of the winter holidays we celebrate hasn’t been all bad. Doris’ little tree still lights our home and I may even drink a glass of eggnog on Christmas Eve.